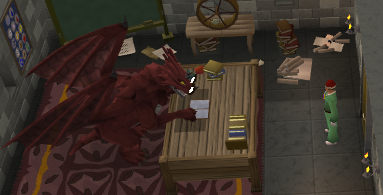 Speak to Mr. Mordaut in the basement of Varrock Museum. 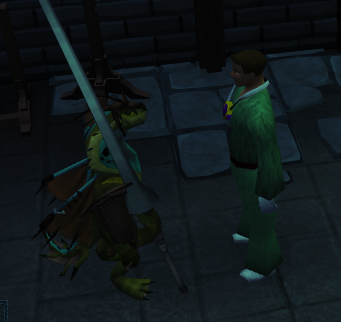 To begin the quest, talk to Mr. Mordaut (apparently he flunked his PhD) in the basement of the Varrock Museum. If you are having trouble finding him, he can be found by entering the door behind the center staircaise in the basement. Ask him about One of a Kind. He says he has uncovered the final journal of the Dragon Rider Hannibus. Accept his offer for you to help out and he will give you the last journal of Hannibus. Read through it (or just hit the next page button as fast as you can like everyone else does) and talk to Mordaut. Tell him Bob the Cat may know something of the whereabouts of Robert the Strong's Library. For this next part, you're going to need an enchanted amulet of Catspeak. If you have lost yours, you can retrieve it at the Sphinx in Sophanem if you bring your cat with you. Then, you will need to bring it to Hild in northwest Burthorpe, who will enchant it for five death runes (assuming you have done A Tail of Two Cats). 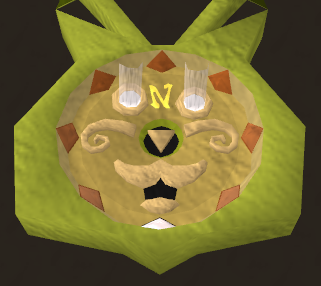 Once you have your amulet of catspeak, open it up and click on the arrows until you see the eyes of the cat light up. Follow this direction and occasionally check the amulet to make sure you're heading in the right place. Once you have found Bob, ask about One of a Kind. Choose the "A human to look after" option and leave for Unferth's house in northwestern Burthorpe. Teleport to Burthorpe and speak to Unferth about a hidden library. Now remove the carpet to find Robert the Strong's hidden library. If you have not figured out, the answer is rust. Head to the weapons rack in the northeast corner of the room and remove some rust from the weapons to get iron oxide. Use an emerald (cut or uncut) with the iron oxide to get an animate rock spell. Now just use the spell on the "statue" in the back of the room to free Hans Solo Hannibus. Speak with him. Tell him he could go back to his homeworld and suggest looking around the library for answers. Investigate the western bookcases, the eastern bookcases and the map in the back and you should come across the phrase "Kletter Draekeun dosk Arakken Ullergrax." If you use the translate option you will get a phrase referring to a Dragon and the Forinthry Dungeon. Now it's time to investigate the dragons of Forinthry Dungeon. For this part you'll need to go into the wilderness. The only thing you need to bring is your Dragonkin Primer. You should also bring a teleport if you run into trouble. Antifire protection is not necessary as the dragons are not aggressive. Head to the southeast corner of the dungeon and a cutscene will ensue. Hannibus will ask a dragon about the "creators" and the dragon will direct you to a glowing inscription. Study the inscription and read from your primer, which should direct you to "South Dungeon Brimhaven." Now run to the southwest portion of the dungeon so you can teleport out. This time you will need the gear to kill three iron/steel dragons. Bring antifire protection and some weapons. 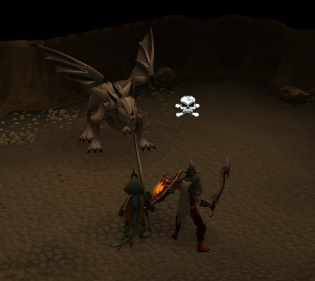 Now head to the Steel Dragons in Brimhaven Dungeon. For help getting there, consult the Brimhaven Dungeon guide. Hannibus will have trouble dealing with the dragon, and an iron dragon will begin attacking you. 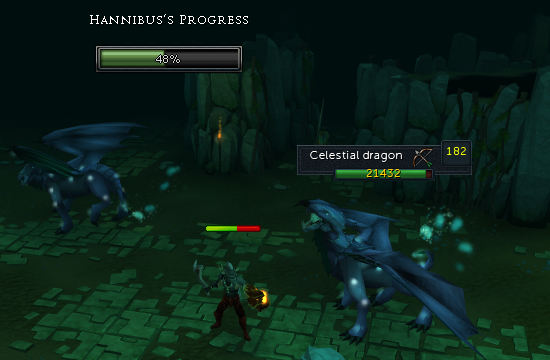 Keep killing the dragons which attack and give Hannibus words of encouragement. After three dragons, he will finally communicate with the dragon. Now head towards the dungeoneering dungeon entrance on the west wall. The next clue will have to deal with "the first dragon." Now it's time to defeat the Queen Black Dragon! Actually it's not, but you're going to have to investigate her entrance. 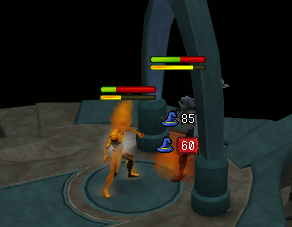 Head to the dungeon west of Port Sarim and take the shortcut to the entrance. Now investigate the portal and you'll land up in the Queen Black Dragon's lair. Fortunately for you, Hannibus will communicate with her in via her dreams. Things go a bit wrong when the dragon begins to turn the tables and takes control of Hannibus. 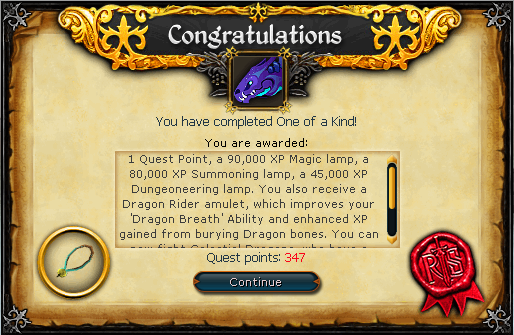 Ask the Queen Black Dragon about the Dragonkin and she will mention a dungeon in Dragontooth Island. For this next part you'll have to deal with a celestial dragons. Head to Port Phasmatays and speak to the Ghost Captain in front of a small rowboat. You must have an amulet of ghostspeak to get there unless you have completed the medium Morytania tasks. Once there, head to the southern portion of the island and enter the dungeoneering entrance. You should now find yourself in a lair with two celestial dragons. You will be asked to tank out the damage and keep them alive. Attack one and keep fighting (though don't kill one!) until Hannibus is done with the communication. You should see a bar indicating how far you have to go. Now speak to Hannibus, who will have no clue what to do next and suggest investigating the statues. Head to any one of the four locations and bring your animate rock scroll with you. When you find the statue, recite the words on the scroll and the figure will come to life! He'll tell you that he was moved so he could be facing the Holy Grail and must be re-positioned. Re-position him so he can face the "sleeper" (your character will automatically do this) and head towards the next statue. Only two statues in total need to be turned, however turning all four will grant you 10,000 bonus experience in any skill of your choice. Once you have turned at least two of the statues, head towards the "sleeper," whom is located on Entrana. Recite the scroll when you are nearby. Ask about the ability to travel between worlds and he will speak of a great beast with three heads who will know of a passage. This can only mean our old friend the King Black Dragon. For this next part you will be fighting a several opponents whose combat levels are in the 130s. 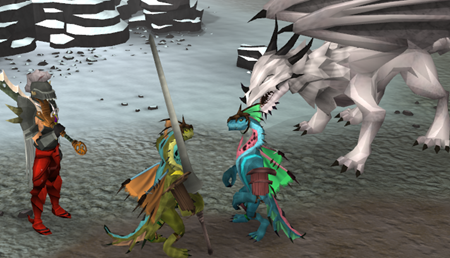 Head to Edgeville and use the artifact north of the Monastery to teleport to the King Black Dragon's lair. Go through the conversation where the King Black Dragon will speak of a white dragon. He will take you to the entrance of the resource dungeon. Enter it (you will be in high level wilderness for a short time) and speak to Therragorn. Go through the conversation and three dragon hunters will appear. Each one will attack with a separate style. You can trap the melee hunter behind either one of the fighters of Hannibus, thus it is suggested you take care of the range and mage hunters first. They all have ability bars and can use stuns and ultimate abilities, so keep freedom in your ability bar and keep hitpoints high. Once you have killed each one, you will take a ride on Therragorn's back to Daemonheim where you will meet a clever Dragonkin, Kerepac. It will turn out Therragorn has disappeared in the crash and Hannibus is very sick. To get Hannibus back to full health, you will need to do him a favour. He will show you Strisath, a dragonkin who is obsessed by the Stone of Jas. He will ask you to gather the stone's residual energy and channel it into him. Do this and channel it into Strisath. Now, Kerepac will ask you to enter the construct. You should regear at this point and bring equipment for a level 190. You can return to the dungeon by speaking to Kerepac south of Thok in Daemonheim. Once you have done this, tell him you are ready and fight. You will now face off against a level 190 Echo of Jas. 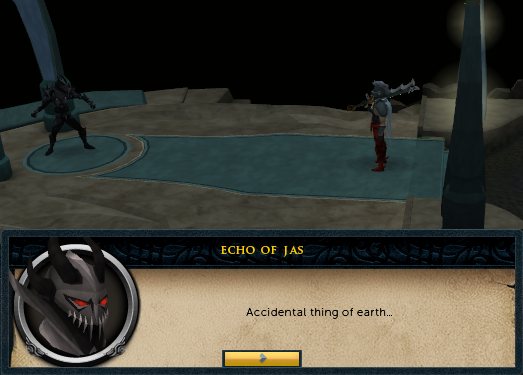 Despite his high level, the Echo of Jas is not a terribly difficult opponent. He uses abilities and stuns similar to the dragon hunters you have met previously. Although he has no listed weakness, he attacks with fire spells and tends to use the metamorphosis ability. Besides that, make sure you keep hitpoints high in case you run into problems with a stun. Once dead, you will reappear outside with Kerepac and Hannibus. Kerepac will warn Hannibus of a horrible ailment that he and his species are facing. He will offer Hannibus treatment, but Hannibus must stay in comatose for many years. Hannibus will ask you to go on a walk outside so he can think the proposition over. Once there, Therragorn will appear with another dragon rider from Hannibus' home world. At this point you can choose Hannibus' fate: to accept Kerepac's treatment or to let Hannibus die with the people of his homeworld. Following this you will complete the quest. Along with the aforementioned boosts, the dragon rider amulet has the following stats. These are slightly better than an Amulet of Glory. If you lose your amulet you can speak to Mr. Mordaut, who will give you a replacement for 500,000gp. As mentioned before, turning all four heads towards the sleeper will grant you 10,000 bonus experience in any skill. 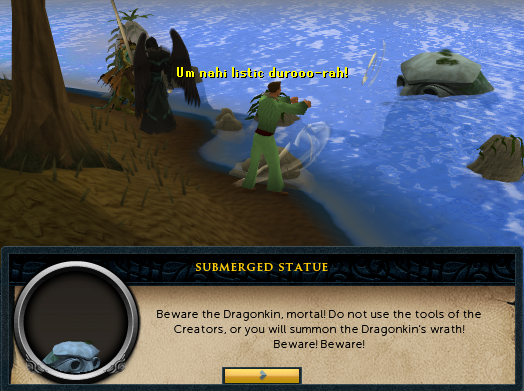 If you have completed Ritual of the Mahjarrat, you may speak to the submerged statue on Entrana (or "sleeper") for 25,000 bonus experience in any skill.